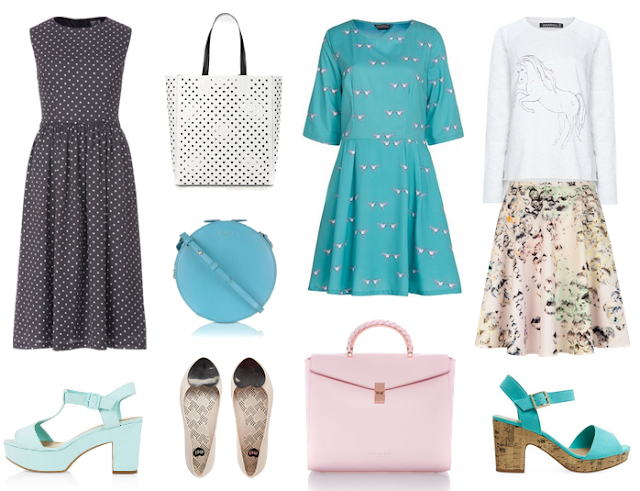 wishlist | the turquoise of the town. including that pastel pink grab bag by ted baker; it's so sweet and innocent looking, and then you'll note the price. granted, everything in this wishlist is on sale, because i made it and i'm cheap, but one of these days i am going to bite the bullet and buy one very expensive handbag. not a mulberry or a blueberry or whatever that other berry brand is called, because i'm not made of money, and they're just bags. but for me, radley and ted baker and even kate hill (to an extent, and only on sale) are some fab quality leather goods, and would totally justify the price. unlike that white tote that i totally bought for about seven quid and will no doubt break by next week. such foolishness. i also bought those turquoise heels on the right and considered buying those mint heels to the left so that i have the perfect trio of them (i have them in two other colours already). i have not ~yet bought any of the dresses, but seeing as both the turquoise and polka dot numbers have a further 15% (at time of writing, possibly not publishing) at the moment, one of them is bound to have made it into a basket by now. like especially that unicorn jumper, amiright?